A little spot of fabric and pattern stashing, planning, and sewing. After a long hiatus and much thought, I do think I'll continue to blog. I like having a record of my sewing. Real life does get in the way, and I suppose I'll never get over hating working on pictures so I guess that means that I'll never be a super regular blogger. However, so many sewing bloggers have stopped, and I know I really miss reading what they wrote and seeing what they sewed! I've actually been sewing rather a lot (for me), and had begun a few posts. I think I'll finish those posts and catch up with what I've made this year. Then I printed some croquis from the Threads website for her. She had a very good time illustrating her ideas! 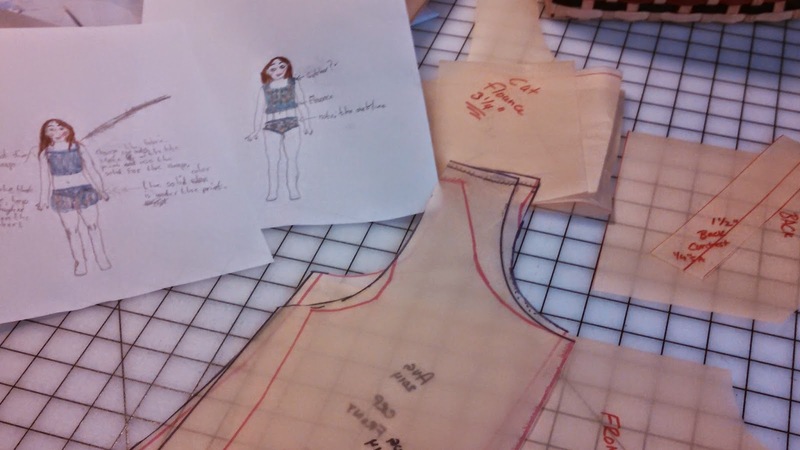 The croquis was a lot of fun and very useful for me to follow as I sewed. A prototype was in order though because it had been two years since I made a swimsuit pattern, and at her age kids grow fast. There don't seem to be many swimsuit patterns available so I just sort of used my last pattern as a jumping point and kept drawing and changing and comparing sizing until it seemed right. Then I tried it out in bright pink and some really wild stuff--leftovers from previous suits. Wild prototype at the bottom. The blue pieces are mix and match separates. Sadly, I do not have a single picture of these being worn! The blue pieces were a lot of fun--there's a basic tank top with a flounce along the bottom and a halter style top with a solid blue band. One of the bottoms is a plain fitted variety with a solid band at the top while the other bottom is skirted (and her fave!). So there you have it! I've done a bit of catching up from last year--only one post left to do and I can see about 2015!